We had an impressive weekend planned, more or less the reverse of my previous attempt at a similar trip several years ago . Sadly, it failed in a similar way, except this time the method of failure was a pressing sou-easterly that made tops travel extremely uncomfortable. It was another victim of the Ruahine winter. 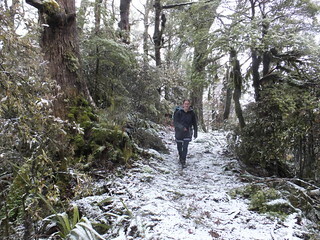 Maybe if I were smarter I’d take a hint, but I know from experience that it’s still possible to get great winter trips in the Ruahine. People: Craig, Alistair, Sarah and me. Intended route: In via Heritage Lodge, head up to Tunupo (.1568), north-east almost to Otumore (.1519), then south-east through the Pohangina Saddle to Longview Hut. 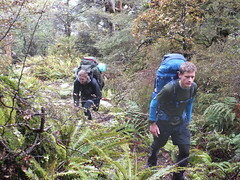 South-south-west past Rocky Knob (.1226) and Te Pohatu (.1132), and down to Leon Kinvig Hut for Saturday evening. Up to Toka (.1519) on Sunday, north-north-east to Tunupo (.1568), and back down and out via Heritage Lodge. 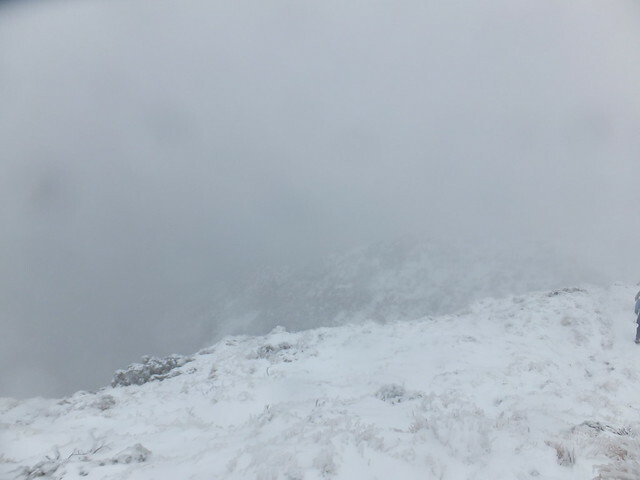 Actual route: To the top of Tunupo, then we turned back rather than risk a very cold and strong snow-heavy southerly. Our weekend’s forecast wasn’t entirely promising, but a strong southerly was predicted to blow through, with luck, by early Saturday, which should enable some good, calm weather for tops travel. 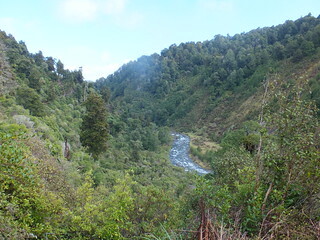 Friday night was a typical drive to the Ruahine Range, leaving Wellington at about 5.20pm or so. The four of us on this particular expedition shared our club van with a couple of groups who had other plans. We stopped for takeaways at Levin. Reaching the main parking area and park entrance, along Peterson’s Road, I stepped outside into what I quickly discovered was a light but severely chilling southerly breeze, at least compared with the bubble of air that had been inside the vehicle. There was some consequential messing around in the drizzle before we left towards Heritage Lodge, with me being one of the less-organised as is sometimes typical, but I eventually had several layers and a head-torch and a GPS tracking where I was going, and everything else. At 9.30pm we were finally moving towards Heritage Lodge, intermingled in torch-light between others from the club. Within 5 minutes the layers meant I was over-heating, partly due to the moment and probably also thanks to the forestry insulation. Craig had armed himself with reports of perhaps two serious slips, which reportedly were not easy to get around. Taking this news in the context of how accessible Heritage Lodge usually is, we hoped that any slips we encountered would be completely navigable. We didn’t encounter any serious slips at all, but in daylight we later noted that there had obviously been some recent clearing of major track damage in two separate places. Heritage Lodge on Saturday morning. 45 minutes later, sometimes after 10.20pm, we arrived to a hut that was occupied by a few hunters. I’m not sure where everyone ended up at this point, but Craig and I immediately set ourselves towards bedding down on the deck outside—partly so as to be less disturbing to the inhabitants but also because we figured it would probably be about to get quite hot inside. Several others followed our lead, and we dozed off—the lodge being sheltered enough to mean the light rain only fell downwards. Our aim was to me away by 8am, with a posssibly lengthy day ahead of us, which meant waking some time before 7. Sadly, it didn’t appear as if the southerly had finished going through, but we hoped things might change later in the morning. Those in the other groups departed shortly before us, both groups heading up the river-side track towards Iron Gate Hut, whereas we ventured 10 minutes the opposite way, before following the signs in a generally easterly direction, straight upwards towards our first peak of Tunupo (.1568). 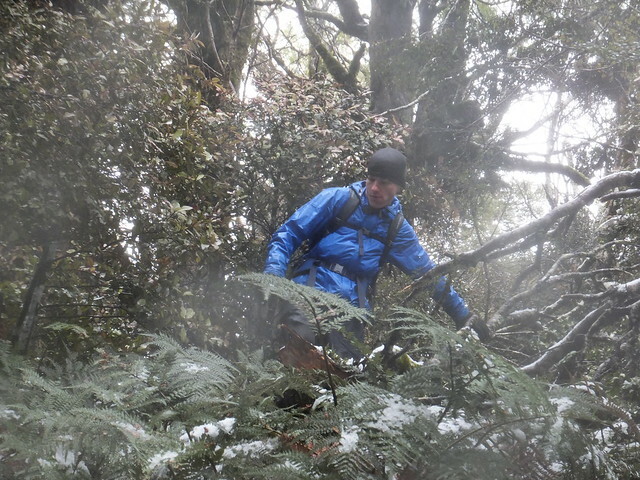 We encountered the first snow, under trees, at about 1000 metres of elevation and after about an hour of climbing, and were following a nicely cut channel through the head-high Leatherwood belt by 1100 metres shortly before 10am, and then continued to stumble through the step-plugging process towards the increasingly snow-covered tops. Sadly conditions proved to be less promising the higher we went, with the southerly showing no signs of having blowing its way through. At this point, and following some stops for snacks and to adjust layering (especially for me given how disorganised I am) we decided that our original plan of a wide loop on the tops to the north-east, past Longview and back to Leon-Kinvig, was increasingly unrealistic. 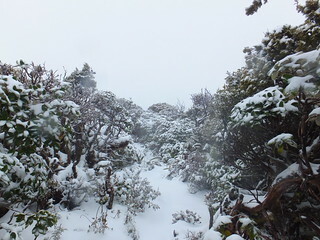 Instead, we resolved to aim for plan B, which would be to aim south-east on the tops for a maximum of about 2.5 km in the conditions, then drop straight down to Leon-Kinvig Hut. By now Sarah and Craig were both struggling with glasses that were perpetually trying to ice over. 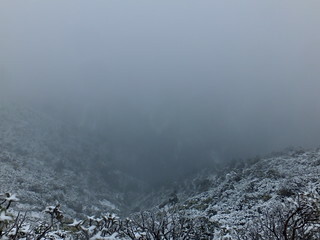 Visibility may have extended to a few hundred metres but we were struck by increasingly strong wind as we neared Tunupo. 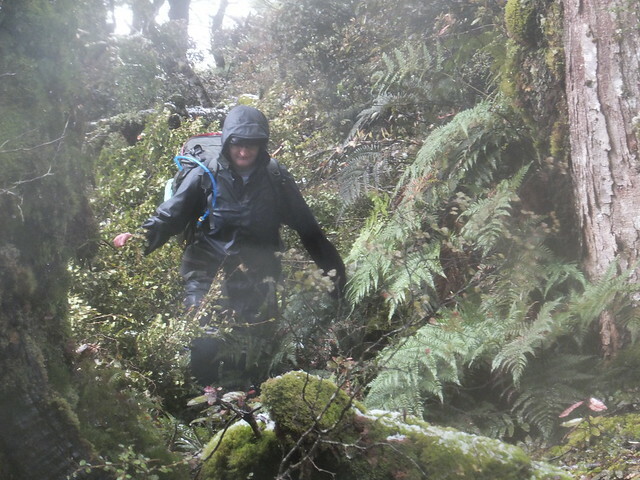 At 11.30am, we stood on Tunupo and tried to look south… directly into a horizontal sleet-storm of icy sandpaper. The four of us spent a few minutes, strategically oriented, discussing our situation and our options. Plan A, spending lots of time on the tops via Longview, was definitely out. Plan B, 3 km on the tops and then down to Leon-Kinvig, might be possible but would be extremely uncomfortable, and potentially still risky given our circumstances. Logic won, in the end, and we decided on plan C to return to where we came. Having snapped a smiley summit photo, we turned tail and hopped back down-hill. 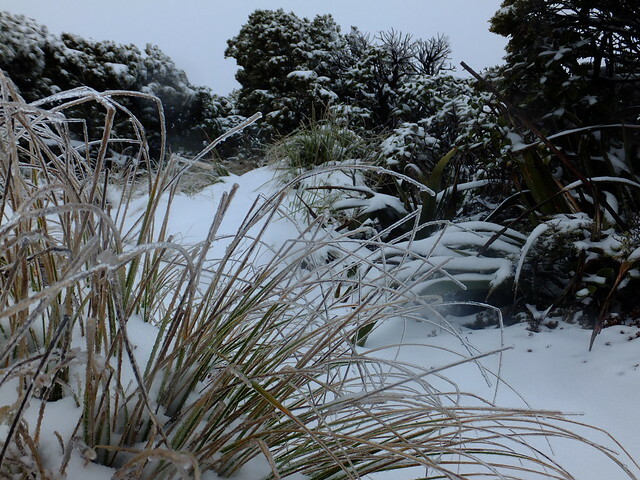 Not a brilliant result for the weekend, but this is how it goes sometimes, and we eventually found that there was the better part of that day of heavy icy southerly snow remaining to be dumped by the system. 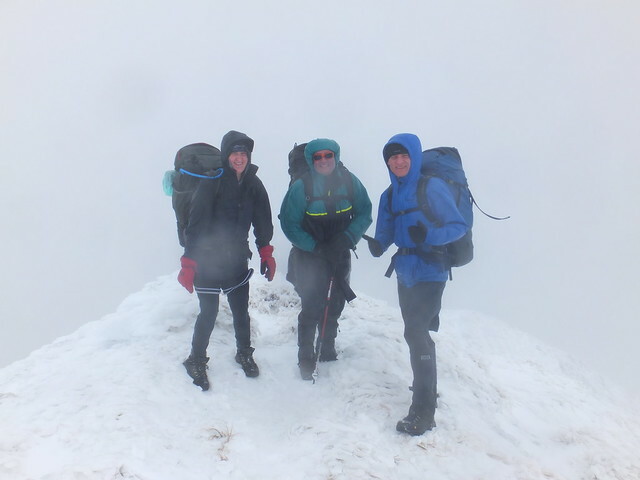 Sarah, Craig and Alistair with our minor Tunupo summit achievement. The sleet is coming from the left of the frame. With no reason to rush, we spent about the same length of time returning as we’d spent climbing—craig even went exploring off-track for a while. We reached Heritage Lodge again at about 3pm. All up, my recollection of the route up to Tunupo is that it involved a little bit of up-hill, but it was mostly down-hill before we ended up back where we’d started. The hunting guys, whom we’d met the previous night, were still home and planning to remain another night. With a few hours to kill before dinner, we chatted for a bit before some of them left to wander around outside and do whatever they were doing… apparently they were on an informal training mission, courtesy of the older chap, and spending a certain amount of time around the nearby rifle range and the river. 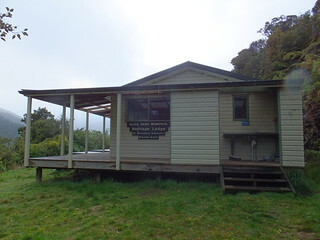 Heritage Lodge, aside from the private section that’s set aside for NZDA members (who funded the building), is treated as a standard hut, on the DOC booking system. This means that to stay there requires a single hut ticket, or an annual hut pass. You wouldn’t know this, however, from the signage at the hut. The lodge was only built in 2007 (after the previous one burned to the ground), and since then there had clearly been a hut ticket box attached to the wall. It had been unscrewed and removed, as had several DOC information signs. An alternative sign stated that visitors should be donating money to the Manawatu branch of the NZDA. I did, however, verify afterwards with DOC that hut tickets and passes were also acceptable. They were on their way to fix the signage. Dinner was a small challenge, if only because we accidentally had an empty gas canister instead of a full one. This was a convenient excuse, however, for Craig to show off his tiny beer-can stove (described here, on his blog ). Some extra-careful balancing and monitoring of our billy was, therefore, required, but the food was just as good. Having seen how populated the lodge was, Craig and I had decided early-on to once again sleep outside, on the deck. This earned us the mocking of several of the hunting guys, who reckoned (seriously I think) we’d both absolutely freeze and be pestered by wild animals. Noting the emergency blankets which they had on their bunks, neither of us was terribly concerned by those warnings. Before we went to bed, the younger chaps went out for an evening explore in the darkness, with someone later coming back with a story which I didn’t quite follow, but it included being abandoned in the dark by the others on the far side of the river. There was no urgency for getting up on Sunday. Our aborted expedition meant that we still had until 2pm before we were due to meet those from the other two groups who shared the van. If they’d had similar problems to ourselves, we predicted that they’d probably all been holed up at Iron Gate Hut, up the river, so we might see them earlier than expected, but probably not much earlier. By now it appeared that the weather had finally blown through. Cloud movement was indicative of a wind change, now coming lightly from the north, but it was sadly too late for us to benefit. 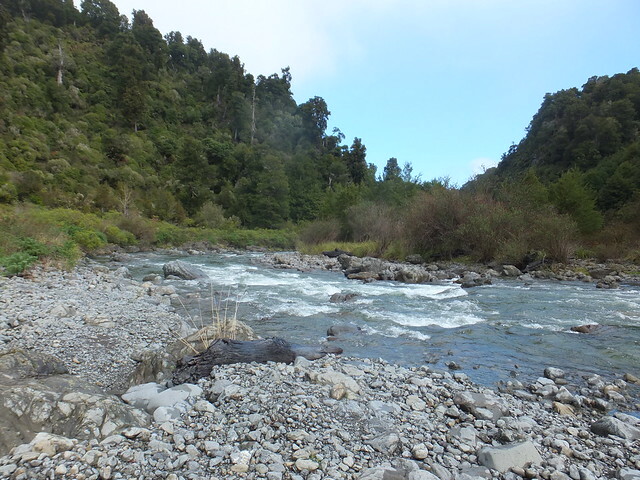 After a lazy breakfast, and having waved goodbye to the hunting quartet, we ditched much of our stuff i, and went for a walk in a correct direction towards the river. Craig had heard something of a recently-built track towards a lookout point over the “Iron Gates” of Iron Gates Gorge, at the mouth of the Oroua River. generally towards the Iron Gates. With time to kill, at about 10.15am or so, we went for a walk in a direction towards the river. 15 minutes of walking later, we turned around back to the hut, and resumed a walk in the actual direction of the river, taking about 20 minutess, from the hut, to follow the widely switching track as it drops about 100 metres of elevation. There’s some nice, camping on the true left, including a long-drop as part of the camp-site. The river itself didn’t look easily navigable, at least in its current level, and the knowledge of a gorge further along didn’t inspire confidence of river travel becoming any easier. The four of us spent some effort trying to push along the river bank, and despite finding at least one very loose and waist-high ground-trail leading up the increasing steep bank of the true left, there was nothing whatsoever that resembled a track cut by design, however. Looking down the Oroua River. It’s a shame that the weather hadn’t gone through as early as was initially predicted. The well-cut path from the river afforded a clear and calm view to the east, towards a snow-capped Otumore and its neighbour, both .1519 and where we’d hoped to be the day before. This time, at least, it wasn’t to be. By 12.15pm we’d returned to the lodge. Those of the other two groups began to filter in, back from Iron Gate where they’d all spent the night, after some had unsuccessfully attempted to get up to the tops. It sounded as if they’d encountered deeper snow the day before than we had ourselves, possibly because it would have been later in the day. Shortly before 2pm, we all left back along the wide track towards the road. With the benefit of daylight, we noticed the end of a new, well-signposted route to Iron Gates Gorge—a route we’d likely have checked out had we known of its existence earlier in the day. 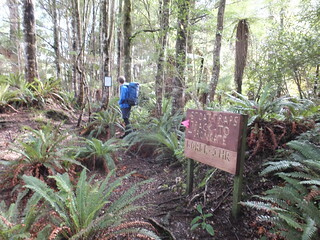 The Iron Gates Gorge Track is new, and not official (as far as DOC is concerned), but is marked with pink triangles. The sign references the Iron Gates Experience website , so I guess there’s a tourist industry influence operating with this track. Our aborted weekend trip ended, at the road, shortly before 2.30pm where we reached our van. It’s a shame that it didn’t work out, but we aso had a nice weekend away. 4 Comments To "Trip: Heritage to Tunupo (and back)"
Sometimes the trips that don’t turn out the way we planned turn into ones we enjoy the most in retrospect. Reads like a pretty relaxing weekend was had. I have camped with my boys many times down by the river. A great summer spot with some great swimming holes…. Kia ora Mike – had a visitor over from Alaska a few weeks back. 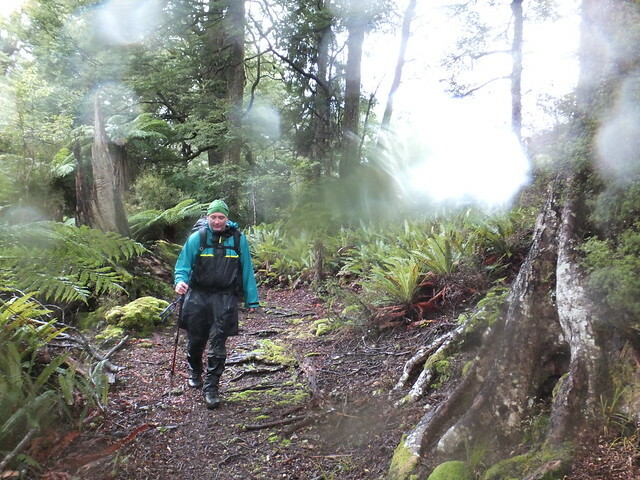 Had a short window so we did a few different walks but the best was dropping most of our gear at Heritage then climbing up to Tunupo and return to Heritage for the night. He loved it. A very fine day walk indeed. We were joined later that evening by a hunting mate of mine and had fresh back steak for tea. We saw no one else. Gotta love the Ruahine. Happy holidays to you and your growing brood.